Rags for Gypsies is a new site developed by Retiarius Internet Design to take advantage of the growth in the use of social media such as Twitter and Facebook to drive traffic to a business. Rags for Gypsies utilises the power of the WordPress platform to provide an easy to use and update web site that the site site owners can maintain and expand themselves. 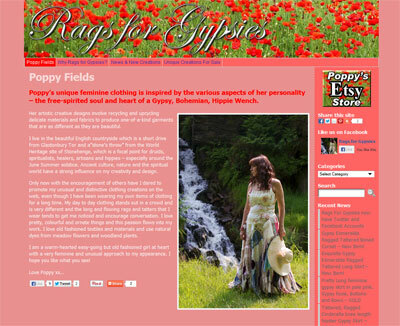 Their website is linked to both Twitter (@ragsforgypsies) and Facebook (http://www.facebook.com/rags4gypsiesdesigns) and also to their marketing account on Etsy.com (http://www.etsy.com/shop/RagsForGypsies) to provide a comprehensive net exposure for the unique designs produced by Poppy Fields. This site shows what can be done to integrate the social media sites into a Search engine Optimised WordPress site. Further to my earlier post on not using frames, a company of my acquaintance had a nicely search engine optimised site. It then seems that someone offered to update their site with a new, experimental, ‘jazzy and upbeat’ look. 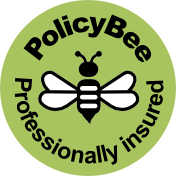 As this was for free they accepted and the new ‘designer’ immediately dumped the existing site and replaced it with their new front-end which basically was a ‘new site coming soon’ and a contact page. They then did not complete the new site but left it unfinished for 4 months. To compound this mistake the new ‘designer’ used Flash/Shockwave to build the entire new site and provided no words that a search engine could find. Result, it is now almost impossible to find this company on Google even if you know the company’s name! Total wipe-out! I don’t know how many times companies are taken in by graphics artists proclaiming to be web designers and the said artist has not a clue as to how the web search engines work. Established well-known companies can use Flash and Shockwave because they are household names and can afford the best programmers and designers who know how to optimise even a Flash site for SEO. These companies can be found by their trading name, Rolls Royce, Amazon, Ford etc. and not by searching for some product such as ‘luxury car’. Unfortunately smaller companies need effective search engine optimised sites so they can be found ahead of their competitors for their keywords. Using Flash and Shockwave for site design provides a desert for search engine bots and I really recommend you do not use them for site design unless you are a household name. And as postscript, Apple iPhones and iPads do not support Flash driven sitres – so why alienate a significant section of the market! WordPress is one the most popular blogging platforms in use today. It has many advantages for site owners wanting a search engine optimised web site. It has many fantastic free themes that can be used and modified to produce a look and feel for your site that suits your business. It is almost infinitely customisable by web site designers by using the extensive free plug-ins and widgets to ad functionality and ‘eye-candy’. This post is about the plug-ins and widgets that I think are the most useful. So here they are in alphabetical order. Help your visitor promote your site! The AddThis Social Bookmarking Widget allows any visitor to bookmark your site easily with many popular services. Sign up for an AddThis.com account to see how your visitors are sharing your content–which services they’re using for sharing, which content is shared the most, and more. It’s all free–even the pretty charts and graphs. By The AddThis Team. This plugin will optimise your WordPress blog so that your posts and pages are indexed more efficiently by the search engines. It is fully featured and lets you single out individual pages for optimisation. Akismet: the best comment spam protection available. It fortunately comes pre-installed, though you’ll still need an API key from WordPress.com. This system will prevent your site being deluged with comment spam. If some should get through it makes it easy to kill the offending comments and also notify the Akismet system so that others are protected, just ast they are protecting you. This plugin and wdget makes it easy to embed appointments and events into your blog. So if you are organising exhibitions, conferences or training days this plugin is for you. It can automatically produce a blog post from the data you input for the event and so save you time when working on your blog. FeedBurner FeedSmith: Steve Smith originally wrote this plugin to make it easy to use Google FeedBurner for syndicating your blog. Google FeedBurner has taken over its maintenance. Very easy to use. This plugin makes it simple to add Google Analytics tracking to your WordPress blog. Google Analytics is a very powerful incoming click tracker, allowing to deep analyse the performance of your site and see where your traffic is coming from. Share This: Alex King creates incredibly useful plugins and this is one of them. If you want to make it easy for your visitors to share your posts on bookmarking or social network sites, this is the one plugin you need. This plugin by Alex Rabe makes the production of in-line image galleries in your blog posts easy and effective. The in-built slideshow widget (helper application) aloows you to embed an auto-rotating image slideshow into the side panels of your blog. Flash based Tag Cloud for WordPress. A bit of eye-candy which displays a graphical representation of post tags. So there you have my current top 10 plugins and additions to WordPress. Google announced in early 2005 that hyperlinks with rel="nofollow" attribute would not influence the link target’s PageRank. In addition, the Yahoo and Windows Live search engines also respect this attribute. Learning to implement “nofollow” tags is fairly easy. Learning how to apply them in the proper way does require some skill. The use of “nofollow” tags can serve many different purposes. They can be used to limit the amount of ‘link juice’ that flows out of a page to external pages of different domains, or they can be used to control where the ‘link juice’ will flow to within a site and its internal pages. This post is about the use of “nofollow” tags to control the amount of link juice flowing within a site and its internal pages. To better explain this I came up with an illustration that should help the “not so technical” crowd understand this process. 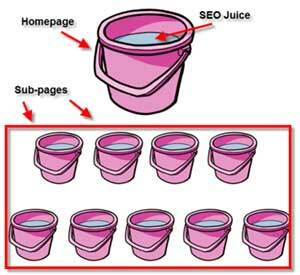 Your total search engine authority can be represented by what I’m going to call SEO Juice”. 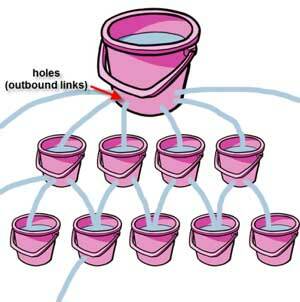 Now, imagine that every link you have, in every page of your site, is a hole in the bucket. 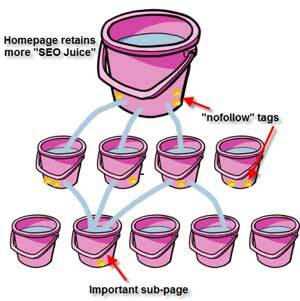 Once the different Search Engines pour their “SEO Juice” into your homepage bucket, the juice leaks out to your sub-pages, and external pages, through every link you have. Once you’ve drawn the “nofollow” strategy map for your site, and decide on what pages need more search engine authority, the implementation part is quite simple. Now that you understand what “nofollow” tags can do for your site, make sure you look into taking advantage of this awesome tool, and take control of where your “SEO Juice” is flowing! Still confused? Let us help you out! Check out our full list of search engine optimization services. Elaine Walker of Elanga International Language Services already had a web site for her language translation business but wanted it fully redesigned to be search engine optimised. The new site had to be easily maintained by herself and to use Web2.0 techniques. Her prime concern was effective search engine optimisation of the new site. As with Ford & Kidd an optimised front page and blog solution was used as this provided the most cost-effective solution. The front page incorporates PHP code that posts SEO optimised resumés of posts made in the WordPress blog which comprises the majority of the site. The PHP code produces fully W3 complaint XHTML code, the result being a site index page with automatically updated content that cannot be detected as such by search engines as being produced by a script. Retiarius Internet Design were approached by local custom truck body builder Ford & Kidd to produce their first web site. Ford & Kidd specialise in producing one-off truck body solutions for both new-build and vehicle conversion projects. Ford & Kidd wanted a web site that they could easily maintain themselves but one that also would be fully search engine optimised. We decided that the best, and most cost effective, solution was to build a front end to the site which was fully optimised for search engines, incorporating ‘hidden’ PHP code into that page that posted resumés of post made in the WordPress blog which comprises the majority of the site. The blog software was set up to include effective SEO and also permit the loading of individual photographs and galleries of photographs of vehicles that have been constructed by Ford & Kidd that could be displayed within the posts.